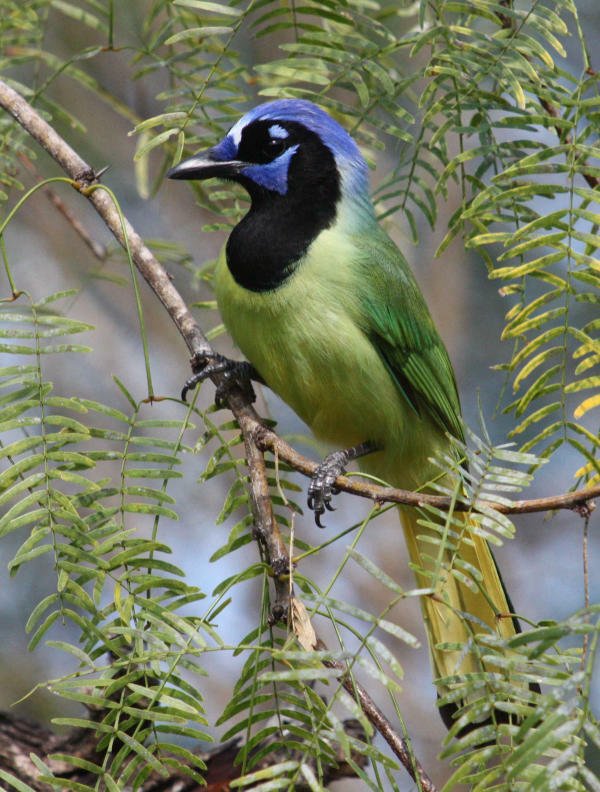 A Green Jay is an iconic borderland bird and always an exciting find in southern Texas. December. When you live in the Northern Plains, December means winter, and I tend to get an urge to take flight – southbound. With the last migrating birds passing through the Great Plains, I want to join the migration south. December before last, I did just that. I pointed my van south and didn’t stop until I reached the Mexican border. 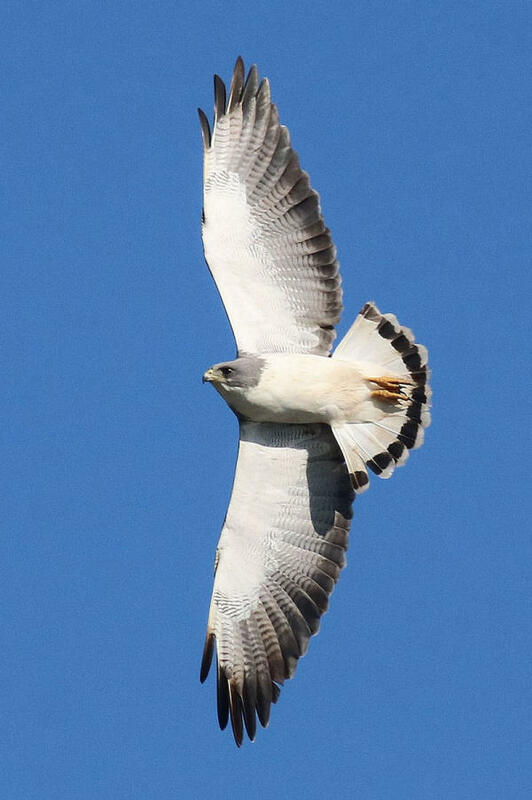 A soaring White-tailed Hawk provided a bright photo of its ventral side. South of McAllen, Texas, I was focused on a special marsh in the midst of Santa Ana National Wildlife Refuge that borders our southern border – the Rio Grande. There I hoped to find a number of the birds I wanted to photograph: Green Kingfishers and Ringed Kingfishers, White-tailed Hawks and Harris’s Hawks; Crested Caracaras and Great Kiskadees, Green Jays and Brown Jays, Altamira Orioles and Black-crested Titmice and, of course, Aplomado Falcons. Santa Ana Refuge is about 90 minutes west of the Gulf Coast, so naturally I also focused on coastal wetlands behind South Padre Island that provided photo opportunities with an array of wading birds including Roseate Spoonbills, Reddish Egrets, Tricolored Herons, White Ibis, Little Blue Herons, plus a variety of wintering ducks, songbirds and raptors. The borderlands weather was a relief, if only for a while, and each sunny day I was intent on photographing the area’s varied and abundant birds. At Santa Ana, the Green Kingfishers were my primary focus, but I took advantage of opportunities to photograph Golden-fronted Woodpecker’s, Plain Chachalacas, Altamira Orioles, Black-crested Titmice, White Ibis hunting, and a surprise dark-brown female Merlin in flight. I was happy I was in a location where I could keep almost constant contact with Green Kingfishers, which provided that jolt of adrenaline every photographer searches for. These little fishing specialists are fast and wary and tough to get good images of because they are so small, and that’s part of the reason I put a lot of emphasis on spending time on the shoreline most utilized by the tiny greens. Throughout my visits to the site, I a little luck with the little Green Kingfishers in beautiful December weather, but none really warmed up to me and yielded a top-end photo – but I enjoyed the effort and managed some acceptable images. During past photo trips to the Lone Star State, I had poor luck with White-tailed Hawks, but this trip I had an abundance of memorable photo opportunities. 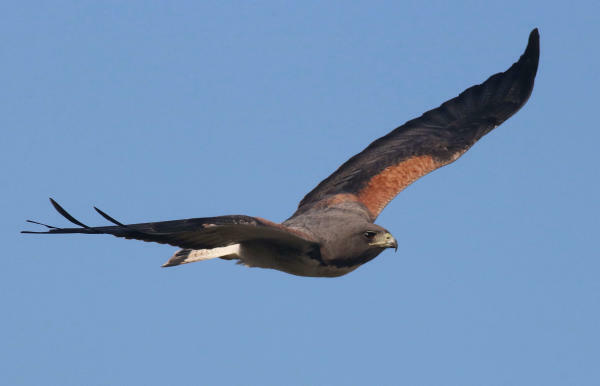 I enjoyed many close encounters with adults and immature White-tails, often in the company of Harris’s Hawks and Crested Caracaras. Approaching at eye level, an adult White-tailed Hawk provided an exciting photo opportunity. Conversely, my luck with Aplomado Falcons was nil. Although I put in a lot of time and canvassed all the best-known Aplomado areas along the coastal plains south of Laguna Atascosa National Wildlife Refuge. Laguna has long been a favorite refuge of mine, but I was terribly disappointed that during this trip the refuge’s infamous long wildlife drive was closed for questionable reasons, reducing the attraction to this avian haven and photo hotspot to near zero. Darn! As a bird photographer, you tend to take advantage of the birds that present themselves, and I eventually focused on the areas where I had the best luck, the wetlands inland from South Padre Island, the terribly rough road immediately west of Laguna Atascosa Refuge, the wetlands in Santa Ana Refuge, and a newly harvested sugarcane field east of Santa Ana – a raptor hotspot during that period. Photo highlights featured pairs of resident Mottled Ducks, a Least Grebe, Black-crested Titmouse, a surprise White-eyed Vireo, a White-tailed Kite in a variety of flight positions, flocks of Glossy Ibis and Black-bellied Whistling Ducks, Black-necked Stilts and Long-billed Curlews, and Long-tailed Grackles bathing in water colored by a reflected sunset. Of course, I saw many other birds, but I’m just naming the species I managed to photograph well. 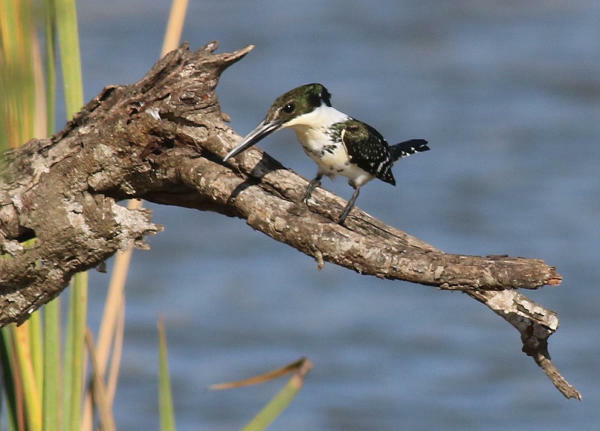 A female Green Kingfisher was one of several "little greens" that provided a special photo test at Santa Ana Refuge. The rarest birds I observed were a female Vermillion Flycatcher, plus a male Vermillion many miles apart. Certainly the borderland region is a true rare bird hotspot where many Mexican and Latin American species have slipped across the border to the delight of American birders. Just this fall, the borderland has yielded a Blue Bunting, Roadside Hawks, a Golden-crowned Warbler, two Fork-tailed Flycatchers plus a White-crowned Pigeon. What exciting species from down south will appear next? The southern tip of Texas is a region I always appreciate returning to, and it is always a fun and productive photo destination. The cities of Harlingen and McAllen make excellent centers from which to plan daily forays into the field, and the south end of South Padre Island is also a fine winter hideaway. Wherever you live, whether it’s a cold weather location or a mild winter clime, whether you have an abundance of birds or a dearth of aviana, South Texas is calling, and you will prosper from your experiences birding the borderlands.